One of the best high flyers in the world. Originally a Toryumon trainee, and has made an appearance in Mexico on Ultimo Dragon promoted shows before going full time in Japan. He has wrestled in several Japanese promotions including Michinoku Pro, HUSTLE, All Japan, New Japan and Zero1-MAX. He made his return to Mexico in 2009 as Sugi/Suguy for AAA as a part of La Yakuza. Made a name for himself in his four month stint, before injuring his leg by backflipping off a ringpost. 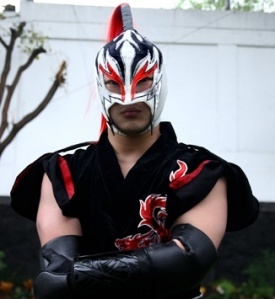 Spent over a year out of action, but returned to AAA in 2011, now as a tecnico with new rival Ronin. Infrequently appeared in AAA in 2011 and 2012, though without out Ronin and still while touring the world a bit. Looked all the way back from his injury, but wasn't on TV enough to make much of an impact. Sugi is now effectively out of the wrestling business, after admitting to framing Nosawa for drug possession. Nosawa and Io Shirai were visiting Mexico as part of a Hayabusa tribute show in May 2012, which Sugi also worked on. Nosawa and Shirai received portraits from fans during their trip. Upon their return to Japan, marijuana was found hidden in the frames of the portraits. Police threatened to charge Nosawa for bringing the drugs into the country until it was found he was not at fault. Nosawa told the press he knew actually did it. Sugi left Japan for a scheduled AAA TV taping, but AAA replaced him on that TV taping and has not used him since. Sugi's subsequently left wrestling. His actions have made him impossible to be employed in wrestling at the moment, but the history of wrestling suggests he may some day return under yet another identity. This page was last edited on 8 January 2013, at 16:49.